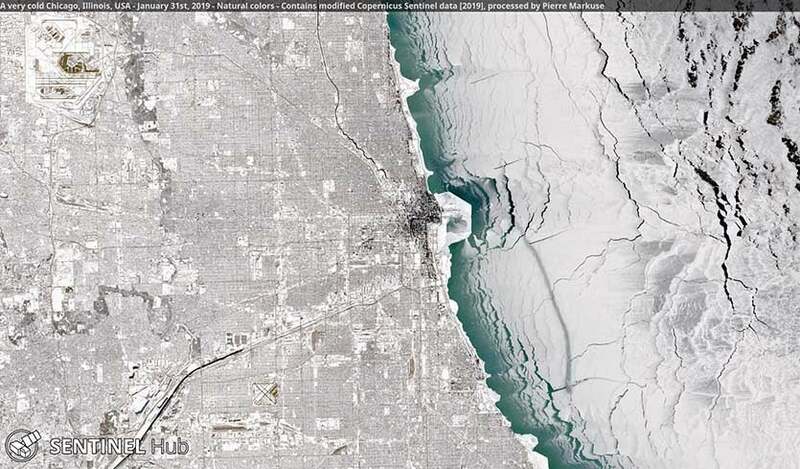 Above: A very cold and snowy Chicago as seen by the Sentinel-2A satellite on January 31, 2019. Image credit: Pierre Markuse. It’s been a week for the record books in the U.S. Midwest, with extreme wind chills and temperatures well below 0°F affecting millions in the region's worst Arctic outbreak since the 1990s. At least four cities plummeted to all-time low temperatures, and a cooperative observer in Mount Carroll, Illinois, recorded a temperature of –38°F, which if confirmed by NOAA would beat the current all-time Illinois cold record of –36°F set Jan. 5, 1999 in Congerville. Much warmer air will be sweeping across the Midwest this weekend: some parts of Iowa and Illinois could end up close to 80°F warmer on Monday morning than they were on Thursday morning! As the worst of the Arctic outbreak gradually moderates, what can we say about the event as it played out in the atmosphere and in popular culture? Sometimes an obscure scientific phrase jumps into the popular lexicon and spreads like wildfire. The phrase “polar vortex” has appeared in peer-reviewed journal articles since the 1950s, and it has been defined in the AMS Glossary for decades. 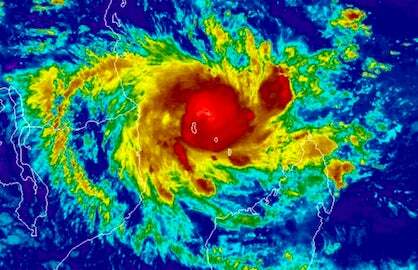 It came into much wider use after science writer Andrew Freedman (now at Axios) began using it at Climate Central during the cold outbreak of January 2014. This year, the phrase was inescapable—a convenient, easy-to-remember scapegoat. 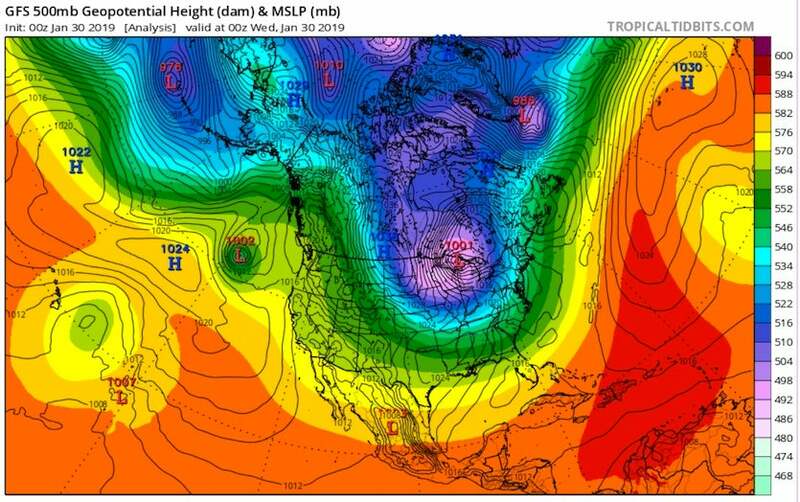 Brightly colored maps made it obvious where upper-level spin was focused over the Great Lakes, making the idea of the polar vortex even more tangible for laypeople. Figure 1. The circulation at 500 millibars, about four miles above sea level, shows a lobe of the tropospheric polar vortex (bright pink) centered over the Great Lakes at 6 pm Tuesday, January 29, 2019 (00Z Tuesday), in association with the extreme surface cold then pouring across the Midwest. There are actually two polar vortices, as pointed out in a 2017 BAMS overview led by Darryn Waugh (Johns Hopkins University). There’s a large, asymmetric polar vortex that spins in the troposphere (the lowest few miles of the atmosphere) year round. A more compact polar vortex develops higher up, in the stratosphere, each fall and dissipates each spring. Figure 2. The two types of polar vortex. Image credit: Waugh et al., 2017: What is the polar vortex and how does it influence weather?, BAMS (January 2017), courtesy American Meteorological Society. Dips in the tropospheric polar vortex commonly sweep across midlatitudes and drag cold fronts with them. Less often—about once every couple of years, but with huge decade-to-decade variability—the stratospheric polar vortex gets disrupted by a sudden stratospheric warming (SSW). 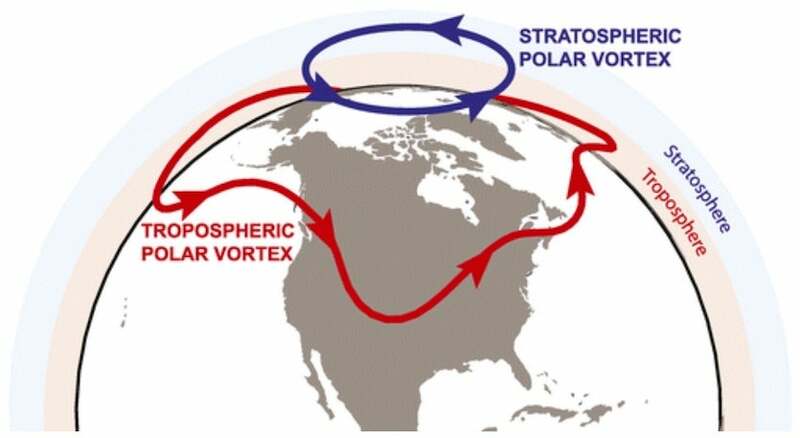 This kind of disruption, which can splt the vortex into two or three pieces, may filter downward over a period of weeks and interact with the tropospheric polar vortex. An SSW preceded the January 2014 cold outbreak by several weeks. Likewise, an SSW occurred in late December 2018, nearly a month before a lobe of the tropospheric polar vortex broke off over the Great Lakes in late January 2019. Waugh and colleagues urge those who use “polar vortex” to clearly distinguish between the stratospheric and tropospheric varieties. They add: “Use of the term without adequate explanation can suggest a more dramatic change to the global tropospheric circulation than has actually occurred (e.g., “The polar vortex is back!”). It can’t be stressed enough: forecasters saw this one coming. As far back as October, seasonal forecasts from The Weather Company called for the “back end” of winter, especially February, to be colder than the first half of winter across most of the central and eastern U.S. When the sudden stratospheric warming occurred at year’s end, it began to raise the prospect of a fracture in the stratospheric polar vortex and the possibility of intense midlatitude cold to come. Finally, weather models correctly projected a week in advance that a lobe of the tropospheric vortex would invade the Great Lakes, bringing a memorable cold outbreak into the Midwest. from the GFS, valid this morning. 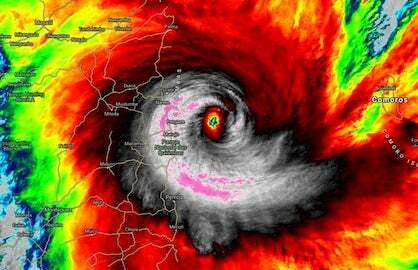 The GRAF weather model unveiled by IBM in January could be a major step forward in this march of progress. 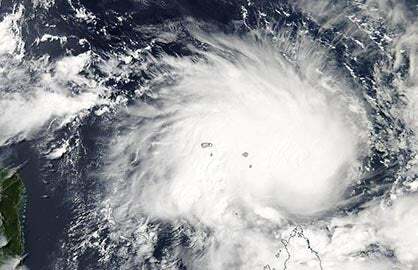 Later this year, GRAF (the IBM Global High-Resolution Atmospheric Forecasting System) will become the world’s highest-resolution global weather forecasting model—the first hourly-updating weather model able to predict something as small as a thunderstorm virtually anywhere on the planet. A model like GRAF could go a long way toward helping target the arrival time and intensity of key events like the snow squalls that whipped through the Northeast U.S. on Thursday and led to multiple highway pile-ups. Figure 3. The emerald ash borer. Image credit: Pennsylvania Department of Conservation and Natural Resources Forestry Archive. This week’s intense cold will have additional victims, but welcome ones—the emerald ash borer, an invasive beetle that has killed an estimated 100 million ash trees in the United States since it was discovered in 2002 in Michigan. 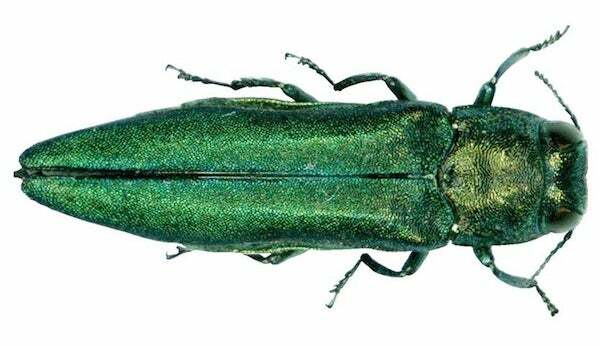 Cold weather kills emerald ash borer, with a mortality rate of about 5 percent when temperatures reach 0°F, 34 percent at -10°F, 79 percent at -20°F, and an impressive 98 percent at -30°F. Most of the Midwest suffers from serious infestations of the insect, and this week’s cold blast can be expected to cause a significant reduction in their numbers. 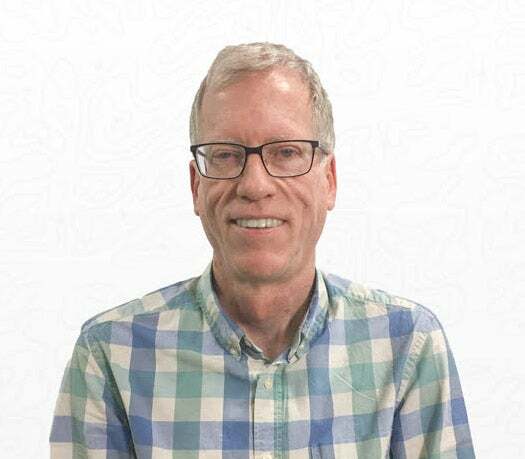 According to an email from emerald ash borer researcher Brian Aukema of the University of Minnesota, “because of insulating properties of bark the cold will set populations back but won't eradicate the pests." Just as we tend to remember a few key incidents from our childhood, it’s the most extreme weather events that stick out in our minds over time. When Midwesterners think of the winter of 2018-19, many will no doubt go straight to this week’s indelible Arctic blast. Yet up through last week, the U.S. was experiencing a notably mild winter (see Figure 4). The extreme cold of January 31 will pull down the final January average shown in Figure 4 by as much as 1°F to 2°F in parts of the Midwest. Even so, the two months combined will end up milder than average across virtually all of the contiguous United States. Figure 4. Departures from average temperature for December 2-31, 2018 (left), and January 1-30, 2019 (right). Image credit: NOAA/NWS/WPC. We’ll have to wait for February to get the final verdict for the three months of winter. A notably cold month could shift the seasonal balance toward cold anomalies in many areas. Yet even an average February would still lead to a warmer-than-average winter for most locations. Much of this week’s media coverage has stressed the potential role of climate change in triggering the “Arctic Midwest.” As we’ve discussed often here at Category 6, there is a very real possibility that events likely caused by human-produced climate change, such as the decline in Arctic sea ice, are leading to a weaker, more variable stratospheric polar vortex. Temperatures across large parts of northern midlatitude land areas haven’t warmed much at all since the 1990s, bucking the trend toward warming that’s evident at most other locations and times of year. Some types of extremes—such as the tendency of the heaviest rain events to intensify over time—have been clearly linked to human-produced climate change, through decades of research and many years of observation. The idea that climate change may be inducing midlatitude cold outbreaks is more complex, in part because it runs counter to extensive global modeling work showing that, overall, winter cold will get less extreme over time. It's even possible that two influences related to climate change—high-altitude warming in the tropics and Arctic sea ice loss—are both having effects on the Arctic's stratospheric polar vortex, as discussed in a tweetstorm on Thursday by Amy Butler (CIRES and NOAA/ESRL). Enjoy a warmer weekend, everyone!